Soldier Killed In Iraq Predicted He Would Die Before his death, Christopher Fishbeck, 24, had confided in his mother that he did not believe he would come home alive. He was among five U.S. soldiers killed in Baghdad on June 6, victims of a rocket attack on their base. 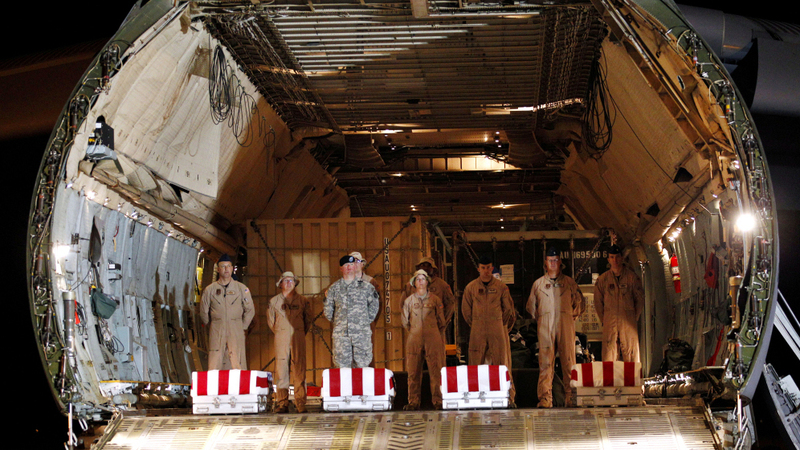 The coffins of Christopher Fishbeck and three other U.S. soldiers killed in Iraq arrive at Dover Air Force Base, Del., on June 8. For U.S. forces in Iraq, the mission — set to end this year — remains dangerous. Three weeks ago Monday, five U.S. soldiers were killed when militants fired rockets into Camp Loyalty on the eastern side of Baghdad. It was the deadliest attack on American troops in Iraq in more than two years. Christopher Fishbeck, 24, was among those killed. Last month, when he was home in Orange County, Calif., on a brief leave, Fishbeck told his mom something no mother wants to hear. "He told me that he felt that there was a 90-percent chance that he wouldn't make it out alive," says Toni Kay. She now knows her son's fears were warranted. "Whether that was based on a premonition that he had or whether it was based on his knowledge of what lied ahead, I don't know," says Kay. "But he just felt a very, very strong sense that he wasn't going to make it out." In high school, Fishbeck played football and wrestled. He was known as a bit of a clown and sometimes got into trouble. In this video, posted on YouTube by one of his high school teachers, Christopher Fishbeck performs a rap. "Even the teachers that would get him in trouble, they still loved him," says his wife, Stephanie Kidder. "He didn't really follow the rules all of the time," says his wife, Stephanie Kidder. "I mean, even the teachers that would get him in trouble, they still loved him." After high school, Fishbeck and Kidder fell out of touch. He had big dreams. He was obsessed with physics and outer space. On his Myspace page he talked about wanting to become an astronaut. "I dream to become an American Hero," wrote Fishbeck in the "About Me" section of his page. "I dream to change the world. I dream to impact society." He decided joining the Army was the way to do it. "He definitely wanted to serve his country and he had no hesitation about joining whatsoever," says Kay, his mother. Last fall, Fishbeck made his first deployment, to Iraq, with the 1st Infantry Division. Before he left, he got a tattoo on his chest that said, "St. Michael Defend Me." Not long after arriving in Iraq, he reached out to Kidder, the girl he had gone out with a few times in high school. "He kept saying 'Stephanie, you're so beautiful.' I'm like, 'Stop messing with me. You haven't seen me in forever. Why are you saying all these things?'" says Kidder, recounting those early conversations. "He's like, 'You are. You're such a beautiful woman.' I'm like, 'Chris, shut up.'" They kept talking, over Skype. Then in March he was able to take some leave. They met up in Germany, where she was teaching English. A week later, they went to a small island in Denmark and got married. Kidder says it was a brief wedding ceremony. They were both wearing jeans. "He's so intense. He's very much, if he knows what he wants, he just goes for it," says Kidder. "For us, it was just logical, because we planned on getting married in the future anyways, to just not waste anymore time and just do it now." Three months later, she's a widow. In May, when Fishbeck was in California on leave, Kidder begged him not to go back to Iraq. She begged him to find a way out of his military contract. "He had told me that this is his commitment. And if he were to finish it then he would feel that he could accomplish anything," says Kidder. "He told me he was going to go back — you know, finish what he started." In the last two months, Fishbeck's family says he told them his base was getting hit with more and more rocket fire. The Army confirms Camp Loyalty, where he was stationed, has been attacked nearly 10 times since March. "When the rocket attacks came in, they basically had to run for cover," says Kay. She says her son felt like the U.S. troops couldn't really defend themselves. "And this was the part that made it so very difficult." 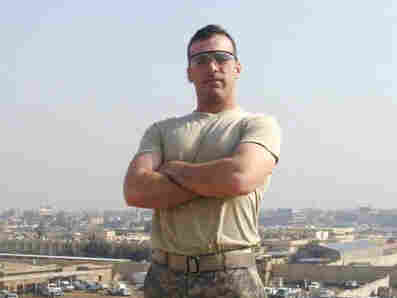 Fishbeck's unit was in Baghdad to work with the Iraqi federal police. In recent weeks, militant attacks on U.S. forces have intensified, says Maj. Gen. Jeffrey Buchanan, a spokesman for United States Forces, Iraq. "These groups have been attacking us and will continue to do so," says Buchanan. But he takes exception to the idea that the troops couldn't defend themselves. "We'll continue to defend ourselves, and bring [attackers] to justice along the way." That's not much solace to Fishbeck's family. They're missing a son and a husband whom they don't want to be forgotten. "He was a lot of things at one time," says Kidder. "There were so many aspects to him, really." Fishbeck's memorial service is Monday morning in California. "I hope that in some small way he had a hand in making the world a place of peace," says Kay.